Flights to St. Thomas land at Cyril E. King Airport—most flights have a transfer in Puerto Rico. If you fly directly from Miami, the flight is just 2 ½ hours. You’ll have just enough time to write a to-do list that includes things like drinking a mai tai and going snorkeling. Once you’re wheels on the ground, you’re just a few minutes from the St. Thomas all-inclusive resort of your choice. The primary language in the U.S. Virgin Islands, including on St. Thomas, is English. But don’t be surprised if your ear catches a whiff of French or Creole being spoken by locals, as these languages are common as well. If you’ve been looking for a chance to brush up on for foreign language skills, just ask a friendly islander to teach you. You can rent a car in St. Thomas from a U.S.-based company, picking it up at the airport and using it to explore every inch of island roadway. The one caveat is that traffic operates on the left side of the road, so if you didn’t take your driving test in London, wise wanderer, you’ll want to pay extra attention to road signs and the flow of traffic. 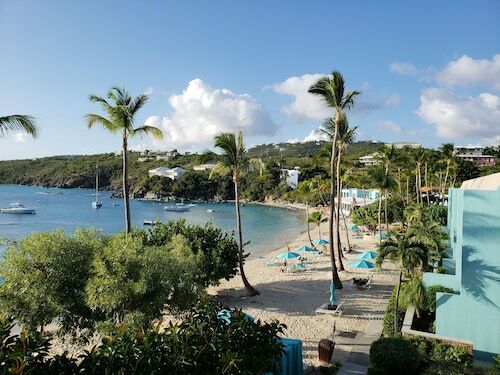 If you don’t want the burden of shuttling yourself around, you can always rely on taxis or open-air safaris (trucks with an open bed) to get you to and from your St. Thomas all-inclusive adults only resort. Water taxis are popular for inter-island travel or getting from one side of St. Thomas to the other. Because St. Thomas is a U.S. territory, your American currency will spend here. You can find ATMs easily, and use your debit card without any problems. Whether you’re spending your cash on drinks or entertainment, you won’t have any conversion concerns. 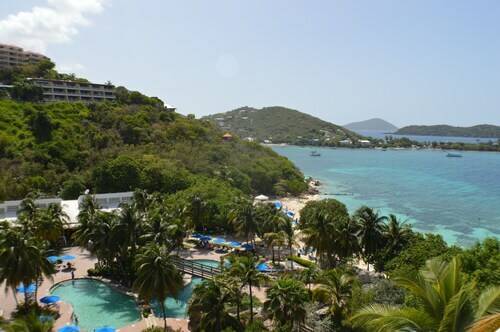 The climate in St. Thomas is tropical, and it doesn’t vary much throughout the year. Show up in January or July, and you’ll be met with about the same temperature: mid-to-high 80s. The rainiest month is November, but even then you’re not likely to be caught in anything but a light shower. So bring your tank tops and pack the sunscreen, because you’ll be under the sun during your stay. This theme park is like no other. The butterfly garden, underwater sea trek, and snuba adventures are just the beginning. You can also explore the 5 acres of lush natural landscape and test your adrenaline with a shark encounter. Miles of golden sand, picnic tables where you can set out a spread, and unfettered ocean before you. A day at Morningstar Beach is something a lot like pure bliss. Wade out into the turquoise waves and build sand castles until you’re ready for dinner. This hilltop castle is a National Historic Landmark and dates back to 1679. It was once used as a watchtower, but today it serves as a unique bit of local architecture and wonderful place to spend your morning. Explore its intriguing hallways on a self-guided tour of the property and then meander to the outer edges of the 5-acre estate to catch unparalleled views of land and sea. Book your hotel with Travelocity today, and you’ll be living on island time before you know it. A word of advice: Bring a floppy, wide-brimmed hat and the mystery novel you’ve been meaning to finish for the last six months. 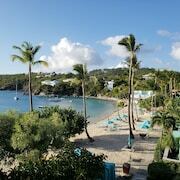 You’ll reach a state of relaxed serenity in the U.S. Virgin Islands that begs for some time laying on the beach.